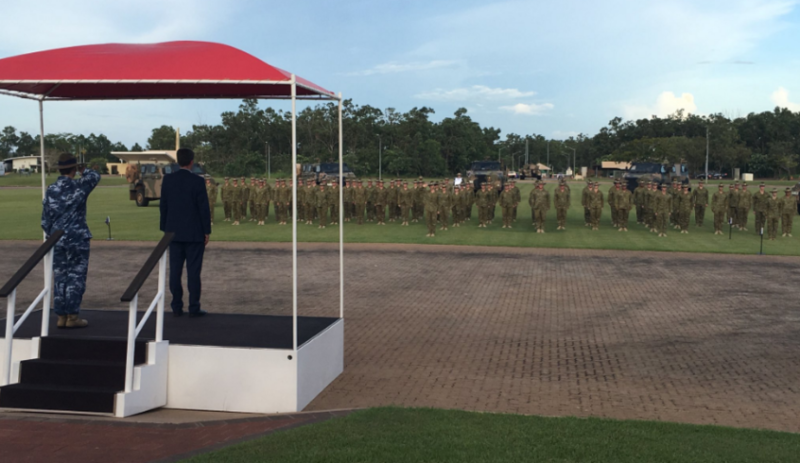 Approximately 70 Australian Defence Force (ADF) personnel were farewelled from Darwin on Friday as they deploy on the next force rotation into the Middle East region. The personnel are drawn primarily from the Australian Army’s 1st Brigade and will deploy to the Middle East region for about six months. Force Support Element 6 is comprised of personnel across a number of Army trades including engineering, personnel, logistic and supply support, health and transport. In attendance at the farewell parade were family, friends and invited dignitaries at Robertson Barracks, along with Minister for Defence Personnel Dan Tehan. Mr Tehan said the soldiers would continue the important work of the ADF in the Middle East region. "The men and women from Darwin’s 1st Brigade continue the ADF's proud tradition of service to our country and represent our commitment to the Middle East region," Mr Tehan said. "On behalf of all Australians, I wish Force Support Element 6 well for their deployment. I also thank their families and friends for their support during training. While the separation of service is difficult, you can be proud of their contribution and commitment to our nation." The commander of the 1st Brigade, Brigadier Ben James, said that the tasks the Force Support Element would be conducting were essential to supporting our forces across the entire Middle East region. "These men and women are charged with an important and inherently complex mission. The provision of effective, reliable and responsive logistic support is a key enabler to the broader Australian Defence Force mission in the Middle East. "They have had excellent training to prepare them for the tasks ahead and I know they will fulfil their duties to the highest standards,” he said. The tasks of the Force Support Element include managing and distributing supplies and equipment necessary for operations, providing maintenance support to vehicles and equipment and providing postal support throughout the Middle East region. Force Support Element 6 is part of the ADF’s contribution to Operation Accordion. Operation Accordion’s mission is to support the sustainment of ADF operations, enable contingency planning and enhance regional relationships in the Middle East region.